River otters are social creatures that use a variety of sounds to communicate. They chirp, growl, grunt and even chuckle. Whether one is alerting another otter of an approaching predator or simply expressing satisfaction over a good meal, you're likely to hear a river otter before you see it. River otters play with each other and often make sounds when doing so. They may chirp, purr, squeal or make gurgling sounds when they're having a good time. Popular otter games include sliding down muddy banks, wrestling, tumbling and chasing one another on land and in the water. Young otters are more likely to chirp constantly and play than adult otters. Otter pups chirp like baby chicks as they wait for their mothers to bring them food or return to the den. Adult otters reserve vocalization to certain circumstances, such as during their mating rituals. After pairing, the male and female otter often twist themselves around each other and tumble, purring and chuckling before copulation. Otters need to communicate to find one another across distances. They stay in family units but spread out daily. A single, loud chirp is often a locator sound. The chirp vocalization sounds something like a small bird or a tree frog, or even a squeaky wheel. Otters often travel long distances by water or land in search of suitable hunting waters, especially in winter when many waterways are frozen and no fish can be found. The mother otter gives out a single chirp as a locating mechanism for her young to follow if they venture out of her visible range. Young otters will chirp incessantly as they look for their mothers. Otters have several ways of indicating fear or alarm to one another. Hisses and yelps indicate anxiety. Whistling sounds are most often used to beg or send an alarm. A loud, staccato "hah" noise, somewhat like a dog's bark, is used to alert other otters to danger. 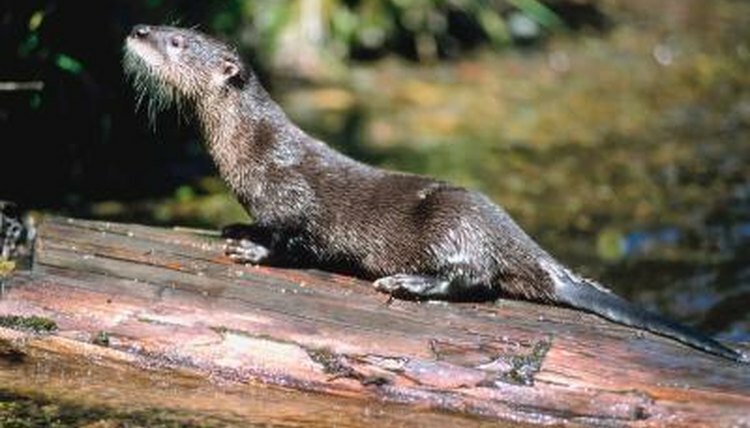 River otters may scream when threatened. These otters are capable of producing a scream so loud it can be heard almost a mile away. River otters rely more on their hearing than sense of smell when avoiding predators on land. Adult otters face little threat from predators, but the young are sometimes attacked. Snapping turtles, coyotes, bobcats, and foxes may go after young otters and occasionally adults. Male otters become competitive during breeding season and will fight each other over territory. During a battle males will grunt, hiss and snarl. The sound can be similar to that of small dogs scrapping. A mother otter, meanwhile, may need to scare off a male from joining her family unit. Male otters are not above taking food from the babies. She may growl and hiss at the male as well as mount a physical attack to scare him off. By limiting the family unit, the mother otter better ensures her offsprings' chance of survival.